"The delivery of goods and materials to almost every typical factory or warehouse usually arrive as unit loads on a type of material handling device called pallets. These unit load bases are one of the most efficient and effective ways to handle large quantities of material and streamline flow. Aside from handling larger loads to sharply reduce loading and unloading times, pallets also serve as a platform base for stacking individual items. Conventionally, every pallet contains a top deck and a bottom deck. Stringers (or runners) separate the two decks and provide an opening for the entry of forks from the lift truck. The dimensions of a pallet are measured in inches and are indicated first by stating the length, and then the width. The length is measured in the direction perpendicular to the direction in which the top boards are laid, while the width is measured in the direction in which the top boards run. Two-way pallets permit the entry of forks from two sides and in opposite directions, while four-way pallets allow the forks to enter from all four sides. 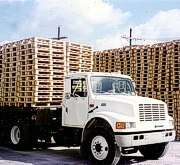 A single-faced pallet contains only one surface (which is the top deck), while a double-faced pallet is one with both the top and bottom decks. For over a long period of time, pallets were purchased and used on the assumption that all pallets were created equal in terms of quality. However, costly product damage and lost productivity due to pallet failures have prompted materials handling engineers and managers to search for such causes. As a result, tools such as computer-aided design and other alternative materials aside from wood are being used in order to obtain the most cost-effective pallet with the best possible quality and performance."